Carleton College’s annual holiday Craft and Custodial Bake Sale will take place on Friday, December 5, 2014, from 8:30 a.m. to 3 p.m. in the Weitz Center for Creativity, Class of 1980 Commons. A wide variety of hand-crafted items and baked goods will be available for purchase, ranging from jewelry, afghans, baskets, outerwear, candles, and much more will be offered by more vendors than ever. Each vendor’s entrance fee is donated to the Carleton College Custodial Scholarship Fund. This popular annual event is free and open to the public. 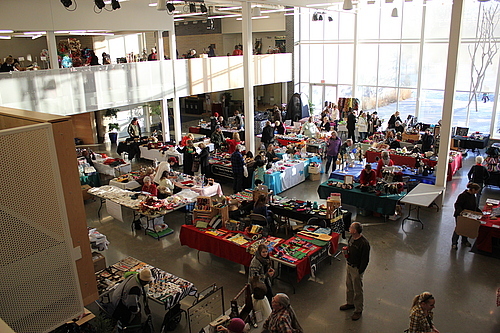 This event was first organized in 1982, as a way to showcase and sell homemade items made by Carleton staff. The Custodial Scholarship Fund was established in 1993. Over three-quarters of the custodial staff at Carleton donate back a portion of each paycheck to help fund an endowed scholarship given each year to at least one Carleton student. In 1997, the first annual bake sale joined in partnership with the craft sale to help raise money for the Scholarship Fund; in 2013, there were $927 in baked goods sold and the craft fair raised $1,965 in tabling fees for a total raised of $2,892. Coffee, pastries, and BBQ lunches will be available for sale with the proceeds going to the Custodial Scholarship Fund. Stop by to pick up your unique holiday gifts, and support a good cause! The Weitz Center for Creativity is located at 320 East Third Street in Northfield (enter at the corner of Third Street and College Street).